Gerald “Red” Armstrong is pictured during his coaching days at McClain. Editor’s Note – The is the third in a series of four stories featuring the 2018 inductees into The Times-Gazette Highland County Athletic Hall of Fame. The inductees will be honored, along with 40 high school senior scholar-athletes, at a banquet scheduled for 6 p.m. Thursday, June 21 at the Ponderosa Banquet Center in Hillsboro. The public can reserve tickets for the event by calling 937-402-2522. He grabbed the attention of legendary Greenfield coach Frank L. “Duke” Hayes as a chunky freshman from Bainbridge nearly 100 years ago, and before he was done with his athletic career as both a player and a coach, Gerald “Red” Armstrong had etched his name into the annals of time. He once scored 58 points in a single basketball game for McClain, a total nearly unheard for a whole team in those days, and once scored 66 points in a single football contest. In one season at McClain he scored 64 more points than all the opposing basketball teams combined, according to a story printed in the Springfield Sun. “‘Duke’ probably was one of the very first high school coaches who ‘recruited,’” according to Hayes’ obituary, printed July 6, 1967 in the Greenfield Daily Times. “Bainbridge came to the McClain gym one night during the 1919 cage season and ‘Duke’ liked the performance of a chunky little freshman named Gerald Armstrong. A 1923 McClain graduate, Armstrong was the school’s first All-Ohio athlete, earning letters in football, basketball, baseball and track. He went on to Wittenberg College and won letters in football, basketball and baseball, coached for a time in Akron, then returned to Greenfield to coach McClain football from 1929 to 1941. His teams compiled a record of 65-29-8 and won South Central Ohio League titles in 1938, 1940 and 1941. The 1938 title was McClain’s first outright SCOL football championship. Armstrong left Greenfield to coach at Denison University, then he left there to become a personnel and training director for an Oil company in Newark. One of the players on Armstrong’s football teams at McClain was 94-year-old Paul Orr, who said it was Armstrong that was directly responsible for him becoming a coach. Orr was the McClain football coach from 1954-59 (37-13-4) and 1966-70 (15-35). “We always learned to leave our helmets on because sometimes he’d come by and stimulate you a little bit,” Orr said with a laugh a couple weeks ago while recalling Armstrong stories. Orr said that one year when his younger brother, Jim, was playing at Greenfield, Armstrong decided he wanted to take his McClain team to Illinois to battle a perennial powerhouse and show that good football was played in Greenfield, too. But an assistant coach, Carlton Sitterle, knew the pair head left, picked them up along the road and gave them a ride back to Greenfield. It was a different time, Orr said, and McClain football players never thought much about Armstrong being a bit tough-handed. “Really, they just expected it of him,” Orr said. Besides, Orr said, there were other sides to Armstrong. Years later, Orr said he was living in Columbus, and Armstrong elsewhere, when Orr learned that his brother Jim had been killed in World War II by a land mine during the Battle of the Bulge. “He knew Jim and I were exceedingly close, and he came up and paid me a visit, which showed me Red was a real guy – a good man an excellent coach,” Orr said. “He was one-of-a-kind. Armstrong also left a lasting impression on Springfield during his playing days at Wittenberg. The Springfield Sun story was penned after Armstrong’s last basketball game at Wittenberg. 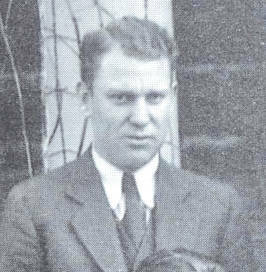 The story goes on to say that during his eight years at McClain and Wittenberg, Armstrong won 21 letters and two “numerals.” It says that in 1925 Armstrong led all Ohio collegiate basketball players in scoring, and that he was close to repeating the feat again in 1926. “In the last three years Armstrong has played his way into the hearts of Springfield fans and it was with regret that they watched his farewell appearance on the home court last night,” the newspaper story said. https://www.timesgazette.com/wp-content/uploads/sites/33/2018/06/web1_Armstrong-Red-mug-shot.jpgGerald “Red” Armstrong is pictured during his coaching days at McClain.